This post is going to be a bit of a departure from the usual subjects I cover here but does have some relation so, bear with me if you can. First some background that I’ve talked about a bit in the various online communities I participate in around the net but never really found the nerve to share in a more concrete form. It’s obviously much easier to be honest in the transient world of IRC and other domains of instant but fleeting methods of communication. I almost said electronic communication but really I’d have to include all forms of social contact with conversation as the key element. As far back as I can remember I’ve had a much easier time dealing with machines and processes than I have with other human beings. As a child I would be more often found engrossed in a book, constructing things from Lego and later Meccano, drawing or dismantling something to find out what was inside. I always preferred solitary activities and never really felt comfortable with praise or criticism – engaging in social activities always left me feeling like an alien in a world that made no sense. If you’re a Douglas Adams fan it may help to know that the HitchHiker’s Guide character I most identify with is Wonko The Sane. The path I’ve followed through life has mostly been influenced by a coping strategy which led me to mostly do and say what others seem to expect from me. Family members, Teachers, friends, community and the depiction of society at large in the world’s media have all influenced me to attempt to conform to an ideal that I could usually manage for some period of time until something caused me to look where I was heading and decide that actually, that’s a completely insane place to be going. Ultimately that path led through several countries, a few suicide attempts and eventually being sectioned under the mental health act after a psychotic break. There’s a long and convoluted story in there but the details aren’t that important – I might do some writing on those details in the future but dwelling on actual events and memories seems to lead to a place where I fear inducing psychosis again. After many more encounters with the British healthcare system than I care to remember I was eventually diagnosed with Dysthymia which appears to be an illness where the primary state of being is clinical depression, punctuated by bouts of a further slide into the black depths of despair. Engaging with the “experts” has been, for me, an increasing source of frustration and anger which has basically just made me feel that I’m an experimental subject. The process appears to have been “let’s slap a label on here and treat the label then see what happens”. Recently I started counselling which, although quite heavily subsidised, I’ve had to pay for out of my own pocket. Maybe that’s a good thing in a way since the desire to obtain as much value for that money as possible can be a powerful motivator. Some people might see that statement as a justification for the privatisation of the NHS but I think those people would be suffering from the current neo-liberal delusion that seems to be prevalent right now. I won’t expand on that opinion much right now though, there’s a point to this post that I’m trying to get to. The current British government is attempting to reduce the welfare bill in this country through a process that has been subjected to increasing criticism. Anyone prepared to put in some research time will find that the evidence relating to their Work Capability Assessment points overwhelmingly to that process causing real quantifiable harm to people with mental health conditions who are subjected to it. They’ve just started that process on me and it’s already led to a quite noticeable deterioration in my mental health. If you’re a user of the devkitPro toolchains or a participant in the many online communities I belong to then you may have noticed a serious reduction in my activity. That’s symptomatic of another impending double depression triggered by stress. The biggest problem for me is that, from where I’m sitting, society at large is deeply broken and populated by pockets of people operating under a group consensus of shared delusions. Most of them seem to be attempting to force other groups into accepting their particular delusion whatever label it might have and that activity is a blight on society. It’s like a cancer spreading across humanity and it’s destroying people. Experiencing psychosis and being declared unfit for work gave me the opportunity to take stock and fill my time with unpaid voluntary activities that have brought value to society that no conventional employment could possibly have created. I’ve put endless hours into the research, programming work and project management that resulted in what devkitPro toolchains are right now. I’ve studied economics and psychology, helped people to learn how to program and gradually built up my own personal reality bubble where I honestly believe I’ve made a positive difference to tens of thousands of lives. What I really, really want to do is find a way to get paid for the “work” I do every single day and not have that “work” prevent me from spending time with people I love and respect. The very, very last thing that is likely to help me is to be placed in a sausage machine that seems designed to force people to either conform to a particular ideal of productivity or die. While people had been let down by the system, he challenged campaigners who had called for it to be scrapped entirely to come up with an alternative. Personally, I wouldn’t put anything in its place. What I would do is challenge what I see as delusions and try to imagine what a society that cared equally for all its citizens would look like. Such a society might be based around principles of education, opportunity and freedom. So anyway, just some food for thought. I’m sure you have your own opinions and ideas about society’s problems. Join the conversation on Twitter, write your own blog post, have your say in the comments here but be warned, ad hominem attacks will not be published. P.S. This post has taken me most of the day and making the decision to click the publish button has felt like putting a gun to my head and pulling the trigger. I might have to go lie down for a while. 53% of gamers are male, 47% female. Women 18 or older represent a significantly greater portion of the game-playing population (30%) than boys age 17 or younger (18%). 62% of gamers play games with others, either in-person or online. The average age of the most frequent game purchaser is 35. After my recent experience with a broken Kindle I felt the need to write to congratulate you on the best customer service experience I’ve ever had. I was so sad when I pulled my Kindle from my knapsack, toggled the power switch to wake it up and was greeted with a collection of random lines – the worst had happened, the screen was cracked. After a little search around the Amazon website I quickly found the Kindle troubleshooting guide and ended up facing a page where I could place a call to Amazon customer service. With trepidation I hit the call me button and answered the phone which rang barely seconds later. Was this going to cost me nearly the price of a new Kindle to get a repair? I’d previously had the terrible experience of a broken Palm TX screen which wasn’t covered by the manufacturer warranty – in the end I bought a cheap(ish) screen from china and repaired the thing myself. As it turned out I needn’t have worried at all – the service rep asked a few questions about dropping and liquid which were expected and then shipped me a new kindle … at no charge. The only condition was that I shipped back the broken Kindle within 30 days or I would be charged the price of a new Kindle – I was sent a link to a shipping label for the return which I had to print & click another link to arrange for a courier pickup. None of this cost me a single penny. Well done Amazon, you made my day. I’ve updated the dslink tarball with savegame exploits for the french, german and italian versions of Cooking Coach and recompiled the loader with the latest libraries. All the european language versions – spanish, french, german & italian – work on my UK DSi so I assume that the UK version will also work on all EU DSi consoles. For those of you who bought a Datel/Codejunkies DSi Action Replay it’s possible to use this to write the savegame exploit by using this save game converter to convert the RAW saves from the dslink archive into files compatible with the ARDSi. For source format, select “RAW”. As usual, please don’t rehost the archive but link to this post. Have fun. It was about this time last year when I released open source save game hacks for two DSi hybrid games, Cooking Coach and Classic Word Games. I kind of expected somebody somewhere to pick these up and make them do something a little bit more useful than change the screen colors but it looks like I was a little optimistic on that front. Most people that have done anything at all seem to have been trying to do as much as possible in the 8KiB or so available in each save game. Interestingly not one single DSi hybrid game I’ve been able to find since appears to have a name entry – bit odd considering how easy it is to test for and correct buffer overflows for this specific situation. If anyone knows any different, please let me know. Since last year I’ve spent a bit of time hunting around DSi hybrid games and playing around with a few ideas I had about how best to utilise the exploits for homebrew. Mostly I’ve been updating devkitARM & libnds with a few things needed to allow normally compiled homebrew to use the extra 12meg when run in DSi mode. I’m still a little undecided on how best to approach the hybrid model – Nintendo seem to be using a system where extra code is loaded in DSi mode from separate binaries in the .nds container format. So anyway, lest I ramble on for several pages with background and random thoughts, on to the meat of this post. One of the first things that I did on getting into DSi mode was dump the DS mode firmware. As I expected this was identical to the dump made in DS mode – it contains only the wifi module settings and the user data at the end of a 128K flash chip. Most interesting of all was the large block of unwritten space between the two but unfortunately the first 64KiB is protected but that still leaves 61KiB writable – plenty for my nefarious purposes. After some further testing I confirmed that the wifi module flash chip could be written from DS mode and later read when we use the save game exploits to get into DSi mode. This gave me the motivation I needed to revisit a half finished project I had to upload homebrew to a DS over wifi. As an added bonus the wifi uploader also works with a standard DS, everything you need is in the archive. Nintendo seem to have pre-empted an approach like this in more recent consoles, both the DSiXL and later model DSi units seem to deny write access to the wifi module chip. Even when using other methods to load code via the save exploits there seems to be no access to the wifi hardware at all – that’s probably dependent on a wifi enabled hybrid game. Whether Nintendo can or will update earlier units with similar security remains to be seen. Currently all early consoles I’ve tried this method with have been able to run code with wifi access regardless of updated firmware or not. I bought a DSiXL a few days ago to confirm this but I have another couple of methods which work on that – they’re not yet in a releasable state but hopefully that won’t be the case for long. In order to use this method you’ll need three things, a DSi compatible flashcard, one of the two exploited games and a means to write to the eeprom on your chosen game. Eepinator will work if you have a standard DS or there are a couple of devices which allow you to do this from a PC. If you’re one of the many homebrewers who likes to play with mcus then you can probably rig up something with a dev board. I have an arduino and a Fletchtronics Bumble-b sitting at the back of my desk, I might have a play around with those over the next few days and post a howto for those. If you’ve already done something like that then please do get in touch, no point in reinventing the wheel. One word of warning before we get to the all important download link. Nintendo will probably declare your warranty void due to unauthorised software so proceed at your own risk. This method also won’t allow you to run rom dumps and it’s not something I plan to support at any point in the future. Obviously I can’t control what you do when you have the ability to run code but please consider not releasing anything that’s piracy related or has the potential to enable piracy. I believe homebrew can thrive as long as we distance ourselves from the people who want to get their games for free. Please don’t mirror this file, I intend to update it as I add features. Pay attention to the license in the README. It would also be nice if the various news sites that pick these things up would make a bit of an effort and not just copy this post verbatim. Note for UK users, I ordered a couple of copies of Cooking Coach from the main amazon.co.uk listing from inet video. Unfortunately no-one told them that DSi hybrid games are region locked on the DSi, order from the Indigo Starfish listing instead. If IRC is your thing then come join the rest of the homebrew gang in #dsdev on irc.blitzed.org. Author DavePosted on August 25, 2010 July 20, 2011 Categories Nintendo DSiTags dsi homebrew, dslink, hacking, homebrew, Nintendo DSi58 Comments on DSi mode homebrew, anyone? Digital Economy Act – a waste of time and money. Much has been written lately on the Digital Economy Bill, rushed through in washup with little to no regard for democracy, most of it extremely negative or, in the case of it’s supporters, what seem to be outright lies. Wayne Myers has an interesting collection of links in his response to Sarah Teather so I’ll add some of my own opinion and research to his findings. 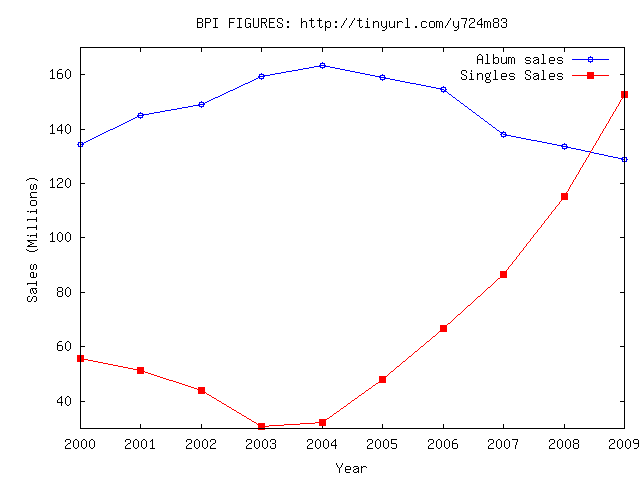 The idea that filesharing is causing huge problems and lost revenue for the music industry seems to be on rather shaky ground considering that sales of singles for 2009 were 152.7m, up 32.7% on 2008, in an economic climate where most other industries saw a loss. Admittedly album sales were down 3.5% to 128.9m but this I think reflects a change in the way fans want to consume music rather than any impact caused by illegal filesharing. These figures come from the BPI’s own website. For a little more impact on these figures let’s look at a nice little graph. According to gamerinvestments.com, the UK games industry saw £1.621 billion in software sales during 2009 – it’s second strongest year on record. Total revenue, including hardware sales, was £3.311 billion – 18% down on 2008 despite the country being in the grip of a serious recession. In an article on gamasutra ELSPA director Mike Rawlinson was quoted as saying “We cannot forget that 2009 saw the UK economy in the grip of one of the most severe recessions of recent times, which has naturally impacted on the entertainment industry. It is not surprising that the UK videogames industry has weathered the economic storm so well, as games represent great value for money.”. Interestingly 2008 saw growth of 23% over 2007 to make it the strongest year on record so 2009’s figures are still rather good when taking a long term view. UK cinema had it’s best year in nearly 3 decades with £1 billion taken at the box office and £200 million taken in DVD sales according to one article at industrygamers.com. So much for unlawful filesharing causing huge damage to the creative industries. Apparently despite record sales the music industry has seen lower profits – perhaps they should spend a bit less on lobbying politicians and suing their customers. Andrews & Arnold Internet service have some interesting things to say on the Digital Economy Act, including a list of possible loopholes. Our elected representatives have shown a lack of technical awareness that would be quite laughable if it wasn’t such a crying shame that they pushed through an act which will do little, if anything at all, to stem the filesharing “problem”. What worries me most is the knock on effect it’s likely to have on coffee shops, internet cafes, clubs and even members of the public who choose to share their wifi access. Companies like Fonera who allow consumers to connect for free to any FON access point simply by buying a Fonera router and sharing their own internet – with even the possibility to earn a little money to offset the cost of their internet connection. Most disturbing of all is the section of the Act that deals with blocking access to “locations” likely to lead to copyright infringment which has the possibility to drive one of my personal hobbies underground – that of reverse engineering game consoles and providing tools for consumers to write their own games and applications. This is something I feel has a big part to play in the future of our digital economy as consumers fight against the restrictions of corporations seeking an ever larger share of the money in our wallets. One of the things the internet has done since it’s inception is blur the lines between producers and consumers, allowing hobbyists to reach an ever wider audience and potentially generate a living wage doing the things they enjoy most. It is my personal opinion that the Digital Economy Act will repress the growth of digital economies and cost Britain dear in terms of investment – who would even consider starting a web business here now? Author DavePosted on April 13, 2010 April 15, 2010 Categories digital economyTags digital economy, digital economy act, digital economy billLeave a comment on Digital Economy Act – a waste of time and money. I’ve just written to my MP urging them to stop the Government rushing the Digital Economy Bill through Parliament without a chance for parliamentary scrutiny. The bill is highly controversial as it gives the Government new powers to disconnect anyone they suspect of copyright infringement. It’s so extreme that internet giants like Google, broadband providers like BT and even the British Library oppose it. Despite all this opposition the Government is planning to sneak it through Parliament with no chance for opposition to be voiced. Please write to your MP now and urge them to do all the can to stop the Government rushing this draconian bill into law. Personally, I strongly believe that the continued erosion of consumer rights in favour of corporate control will inevitably have a detrimental effect on the digital economy. The idea that every pirated copy of digital media is a lost sale is blatantly ridiculous yet some parts of the creative industries insist on demanding legislation to protect their failing business model. I’ll blog more about this in the future – one of the things I intend to do is look at some of the figures being quoted for lost sales and comparing those to income levels and other factors affecting the amount of disposable income in the UK. I’m quite convinced that the money said to be lost due to piracy exceeds any rational estimate of that available in the market.